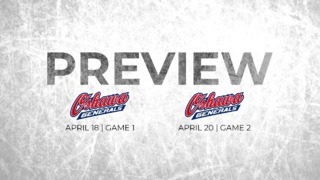 The Ottawa 67’s host the Oshawa Generals Friday night before the team heads out on a two-game road trip. 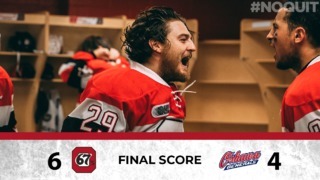 Friday’s matchup sees a ton of talent take the ice at The Arena at TD Place where the 67’s are unbeaten so far this season. Out of everyone hitting the ice, we’ve narrowed it down to the Top Three Players to Watch. Clark enters Friday hot off the heels of a big birthday weekend which saw him light the lamp three times, including a clutch OT winner. Clarke is looking to build off the momentum from last weekend and carry it into Friday night. If Clark keeps up his level play, the 2018 draft eligible forward’s stock is set to rise. 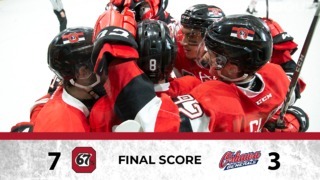 The 67’s rookie has been off to a great start to his OHL career, notching four goals so far this season. The Ottawa native has recently been named to Team Canada for this year’s U-17 World Hockey Challenge. Friday night will be his first game since being named to the roster and the 16 year old is going to bring his national team talent to home ice. Ottawa born Serron Noel returns home on Friday night. The Oshawa Generals forward is currently ranked 31st overall in this year’s draft class on the hockeyprospects.com Top 31 prospect list. The 6’5” winger has played nine games so far this season, tallying seven goals and four assists for a total of 11 points. Noel was also a teammate of Ottawa 67’s defenceman Kevin Bahl on Team Canada, the gold medal winning team at this year’s Ivan Hlinka Memorial Tournament.